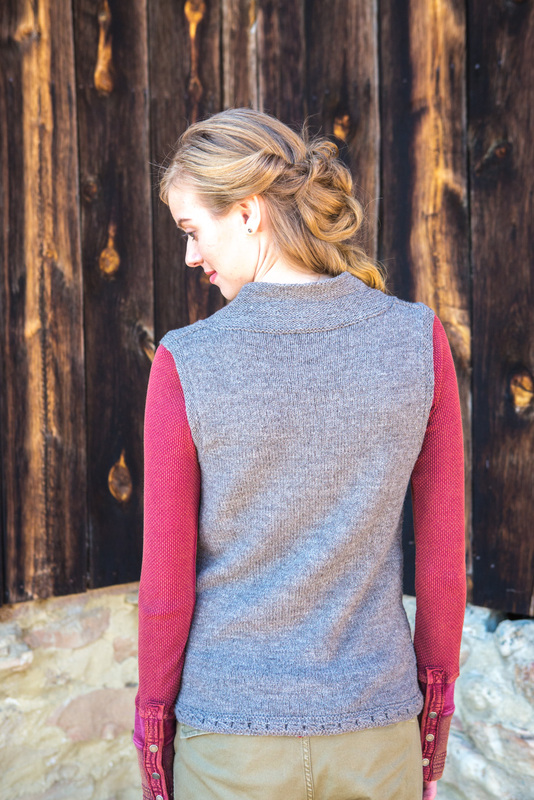 Created with serious outdoor activities in mind, this slim vest is the perfect extra layer to keep you toasty without getting in your way while you head out for your morning chores, ride your bike to work, or walk the dog. Practical diagonal pockets, a slim, jaunty shawl collar, and a sweet, subtle hem detail all make a functional and beautiful garment. It’s worked in pieces and then seamed for solid, long-lasting structure. 31 3/4 (35, 38, 41 1/2, 46, 48 1/2)” (80.5 89, 96.5, 105.5, 117, 123 cm) bust circumference, with 1/2 (1/2, 1/2,3/4,3/4, 1)” (1.3 1.3, 1.3, 2, 2, 2.5cm) overlap and 23 (23 1/2, 24, 24 1/4, 24 1/4, 24 1/2)” (58.5 59.5, 61, 61.5, 61.5, 62 cm) long. Shown in size 35” (89 cm). Intended to be worn with 0–2” (0–5 cm) of positive ease. 900 (996, 1096, 1193, 1317, 1389) yd (823 911, 1002, 1091, 1204, 1270m) Sportweight (#2 Fine). Shown here: Sincere Sheep Equity Sport (100% wool; 200 yd 183 m/2 oz 56 g): color Dark Gray, 5 (5, 6, 6, 7, 7) skeins. Size U.S. 2 (2.75 mm): 16” and 60” (40 and 150 cm) long circular (cir) needle. Size U.S. 4 (3.5 mm) needles. hook; markers (m); stitch holders; waste yarn; tapestry needle; five 5/8” (15 mm) buttons. 24 1/2 sts and 40 rows = 4” (10 cm) over St st using larger needle.